At 3:30 a.m. on Friday morning (February 17, 2017) Sheriff’s deputies assigned to San Dimas station responded to the area of Avenida Ladera and Calle Alto, San Dimas, regarding a “mail theft” call. An alert resident spotted the occupants of a Jeep Cherokee breaking into mailboxes. Responding deputies located the vehicle and conducted a traffic stop on San Dimas Avenue near the 57 freeway. 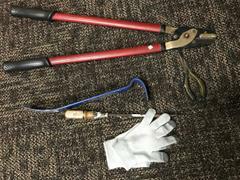 They detained a male and female occupant, and recovered dozens of pieces of mail, as well as gloves and tools used to pry open locked mailboxes. Subsequent investigation determined the mail had just been stolen from at least 9 locations and 16 victims in the Via Verde area of San Dimas. Mario Jerez, a 39 year old male from West Covina, was booked at San Dimas Station on charges related to identity theft, mail theft, possession of drug paraphernalia, possession of burglary tools, and driving on a suspended license. He was held in lieu of $50,000 bail. Erica Ferriola, a 34 year old female from Upland, was held on identity theft charges and several pre-existing arrest warrants, with a total bail of $205,000. If you or a neighbor were the victim of mail theft overnight, or if your mailbox was damaged, we urge you to contact the San Dimas Sheriff’s station to document the incident. Of particular interest to investigators would be incidents in the vicinity of the following San Dimas streets: Calle Alto, Calle Arroyo, Calle Carrillo, and Calle Linda. Detectives will also contact residents where victims can be identified, and we’ll be working with the U.S. Postal Inspector on follow up and criminal charges. We’d also like to ask residents, if at all possible, to remove items from mailboxes at your earliest opportunity. While some items in your mailbox might have little intrinsic value, the information contained in some mail is of great value to thieves seeking to commit identity theft. Stolen information is frequently used to create fraudulent accounts and/or obtain goods and services by fraud. The cost to victims can be enormous. The Sheriff’s San Dimas Station may be reached at (909)450-2700. Thank you!